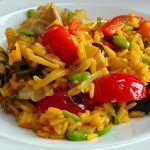 There are many, many paella recipes and it is not always easy to choose which one fits your cravings. The original paella recipe was created in Valencia using chicken, rabbit, snails and three kinds of fresh beans in the summer, and duck and artichoke in the winter. Seafood and meat are not mixed in a traditional paella recipe, and seafood is only used when close to a sea. Now, paella is almost always associated with seafood, chicken and vegetables. The paella dish was named after the pan it is cooked in, a Paellera, which is also used for a variety of other rice dishes. The ingredients people use vary from place to place, and time to time, depending on local traditions and the ingredients available. IBM even programmed an AI system designed to create new food dishes (almost two decades after the supercomputer Deep Blue beat Kasparov at chess, and two years after Watson beat Jennings at Jeopardy), and it created this Indian Tumeric Paella that looks pretty good to us! 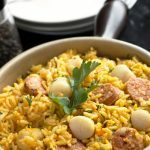 In the end, there is no right or wrong recipe, only the recipe that you like; chicken paella, seafood or no seafood paella, traditional, simple or easy paella. Anything from fresh garden produce to holiday left-overs can inspire a cook to create an original version of this one-dish deliciousness. 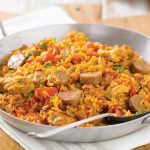 We have gathered the most searched for paella recipes and selected the best ones for you so you don’t have to waste time and can focus on the cooking. 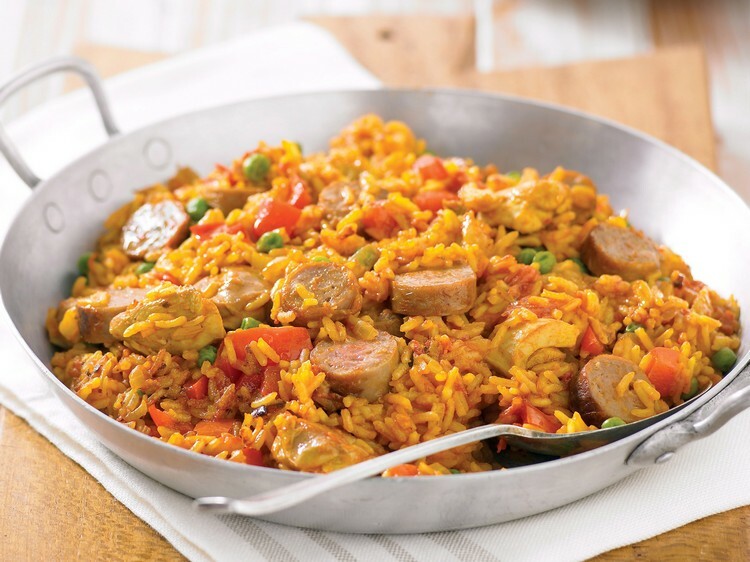 This is an incredible twist from the traditional paella recipe. This scrumptious dish from realfood.tesco is composed of smoked gammon steak and yummy sausages. In a large, shallow pan heat oil and add the onion and garlic. Cook until the onion starts to soften. Then, add the gammon and sausage, continue to cook until browned. Add the paprika and the rice, cook for 1-2 minutes. Add the saffron (plus water) and about half of the stock. Stir well, add the pepper and the beans. Bring to the boil and allow to simmer for about 20 minutes. Add more stock during the cooking as it becomes absorbed, stir and then leave to absorb all the flavours. 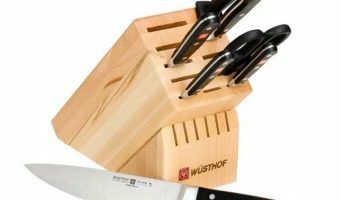 Serve straight away as soon as rice is tender and the liquid absorbed. Heat the oil in a shallow pan on medium high heat and fry the chorizo until it starts to brown and release it’s orange colored oils. Add the onion and continue to fry until the onion has softened. Add the garlic and fry another minute. Add the scallops and sauté 5 minutes. Remove the scallops from the pan and set aside. Add the white wine and allow to almost fully evaporate before adding the rice. Coat the rice with the other ingredients and then add the stock, paprika, smoked paprika and parsley. Bring to a boil before reducing the heat. Cover and leave to simmer 15-20 or until the rice is tender. 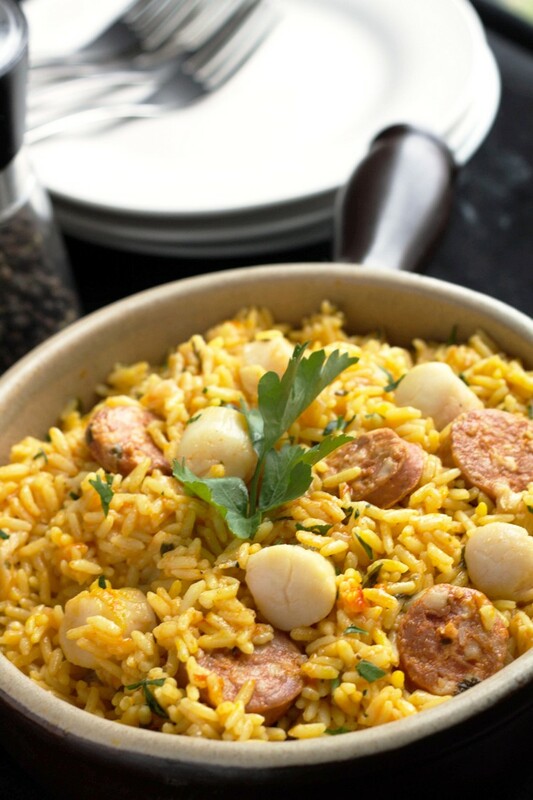 Remove from the heat, add the scallops mix to warm with the cooked rice and serve. 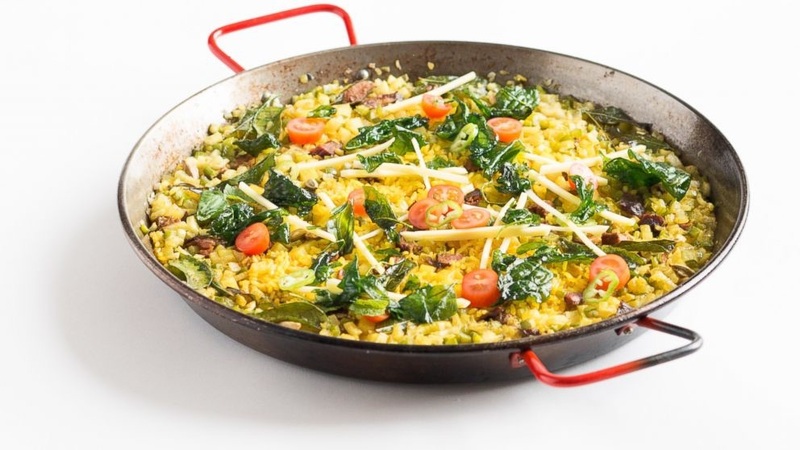 Turmeric is an excellent match for this veggie paella. Aside from turning the rice into yellow, it can also provide a spicy and warm flavor. This is the perfect meal for a warm summer day! Start by chopping the onions, garlic, red and yellow pepper, zucchini squash, mushrooms and tomatoes. Heat the olive oil over medium heat in a large saucepan and sauté the garlic and onion for about two minutes until golden brown. Add the red and yellow pepper, tomatoes, zucchini and mushrooms and cook for another 5 to 10 minutes. Add the frozen veggies and green beens and cook for 5 more minutes. Now add the brown rice and cook until it turns translucent. Pour in the vegetable broth (make sure it is hot), then add all the spices. 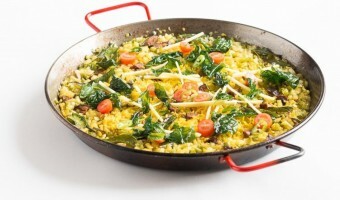 Cook the veggie paella on medium or high heat for 40 - 50 minutes while frequently stirring. 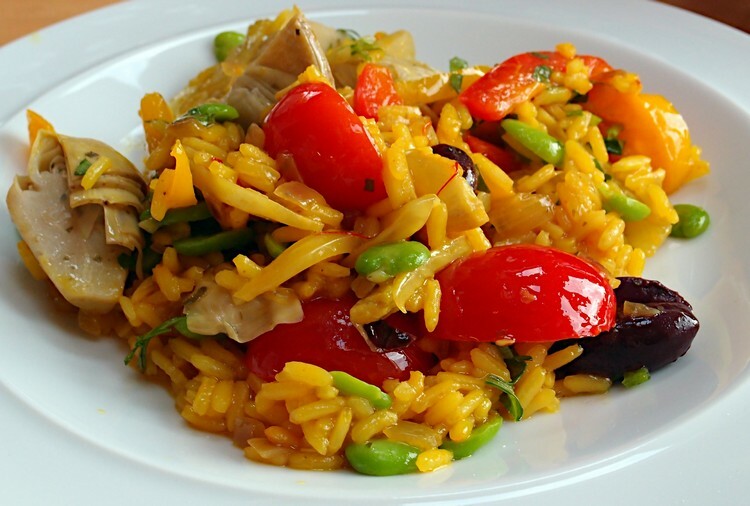 Don’t worry if your paella looks like paella soup – it takes a while for the rice to absorb the vegetable broth. You might even need to add more broth when the rice gets too hard or dry. Cover the paella with a kitchen towel, pour the lemon juice over it and let stand for at least 10 minutes before serving. Paella is one of the most popular dishes and yet it’s quite impossible to define precisely what it consists of. 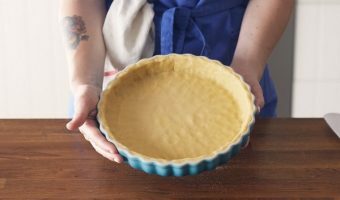 There are a plethora of variations from different cooks and most of them are claiming that their recipe is the most authentic. The paella recipe has a humble beginning. By learning about its history, it can help us understand why there are a lot of varieties. Paella actually originated in Valencia in Eastern Spain. This dish was originally a farmer’s food. It is cooked in an open fire and they ate this during lunchtime. 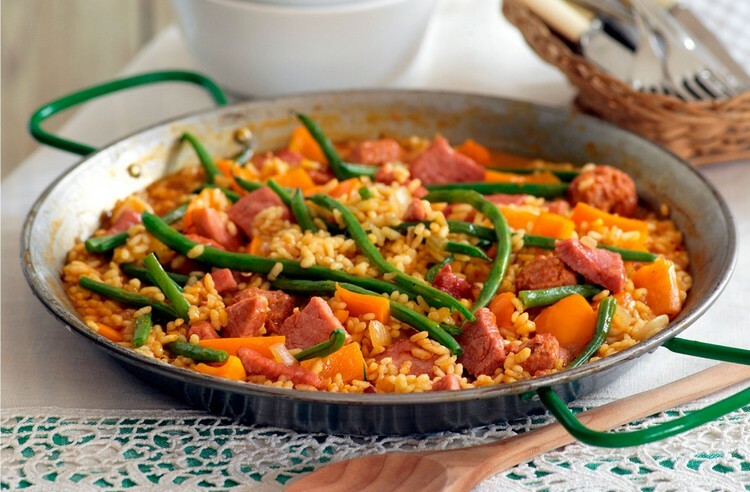 Paella consists of rice along with tomatoes, onions, beans and other vegetables that can be found in the countryside. To make it extra special, a rabbit, duck or a chicken is added. A touch of saffron can make it tasty and colorful. Traditionally, it is eaten directly from the pan where it was originally cooked with the use of a wooden spoon. So, where did the name “paella” came from? There are actually a lot of theories on the origin of its name. Paella may have originated from the Latin word “patella” meaning pan. 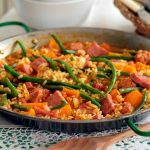 Another theory is that a lover prepared this dish especially for his fiancée, thus “paella” is actually a combination of “para ella”, a Spanish phrase which means “for her”. Some implied that the name “paella” originates from “Baqiyah”, an Arabic word which means “leftovers”. This is because the servants from Moorish royal banquets would gather the leftovers and cook them on an open fire. The best thing about a paella recipe is the sense of enjoyment. It’s so magical when your family and friends will gather around and enjoy the paella experience. You will eat, talk, laugh, and smile while enjoying each others company. 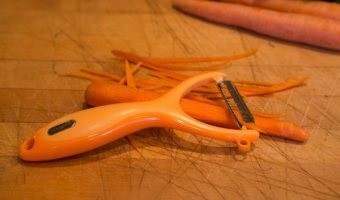 There are several ways of enjoying it as well, from authentic seafood to healthy veggies cut in strips. In fact, you can even get creative and invent your own paella recipe. Just like what Jamie Oliver did when he added chorizo to paella. Unfortunately, some people from Spain did not admire it. The dish can be cooked in an oven or in open fire. What is your favorite paella recipe?